Eddie Plank fidgeted. On every pitch, Plank went through a seemingly endless ritual: Get the sign from his catcher, fix his cap just so, readjust his shirt and sleeve, hitch up his pants, ask for a new ball, rub it up, stare at a base runner if there was one, look back at his catcher, ask for a new signand start the process all over again. As if that wasn't enough, from the seventh inning on, he would begin to talk to himself and the ball out loud: "Nine to go, eight to go . . ." and so on until he had retired the last batter. Frustrated hitters would swing at anything just to have something to do. His fielders would grow antsy. Fans, not wanting to be late for supper, would stay away when he was pitching. Writers, fearful of missing deadlines, roasted him. Plank rarely threw to a base to hold a runner close. Sad Sam Jones, good enough to win 229 games over a long career, told Lawrence Ritter, "I once heard Eddie Plank say, 'There are only so many pitches in this old arm, and I don't believe in wasting them throwing to first base.' And he rarely did. Made sense to me. I was just a young punk, and I figured if it was good enough for Plank it should be good enough for me." Somebody that annoying can hang around for only one reasonif he's a winner. Plank was exactly that, winning 326 games, the most by any lefthander until Warren Spahn and Steve Carlton came along. His 69 shutouts remain the standard for southpaws. Despite all his accomplishments, however, it was Eddie Planks fate to be second banana. He had some great seasons and many good ones, but there always seemed to be someone having a better one. Usually it was Walter Johnson, but there would occasionally be someone like Jack Chesbro, Ed Walsh, or Joe Wood, whose overall careers weren't the equal of Plank's. Accordingly, in no season was he considered the top pitcher in the American League; he had to be satisfied with being one of the top four or five, but he was in that position year after year, and while other pitchers came and went, Plank persevered, helping the Philadelphia Athletics to five American League pennants and three world championships. "Plank was not the fastest," teammate Eddie Collins once observed. "He was not the trickiest, and not the possessor of the most stuff. He was just the greatest." Edward Stewart Plank was born in Gettysburg, Pennsylvania on August 31, 1875, the fourth of seven children of David L. Plank and the former Martha E. McCreary. Growing up on the family farm, Eddie never played baseball until a neighbor organized a team when Eddie was 17. From the start, the young lefthander threw with a natural cross-fire motion he called a "slant ball," landing his right leg on the first base side of the pitchers mound and then throwing across his body. This off-balance method of throwing usually resulted in wildness, but in time Plank became perhaps the greatest cross-fire control pitcher in history. Eddie pitched for town teams and, at the age of 22, enrolled in Gettysburg Academy, a prep school under the auspices of Gettysburg College. Frank Foreman, a fair to middling pitcher in the 1880s and 1890s, was the coach of the Gettysburg College team. When Foreman saw Plank's unorthodox delivery, he promised Plank, "If you follow my instructions closely, I'll make you one of the greatest southpaws in the country." Plank never attended the college but played on the team, a common practice in an era of lax eligibility requirements. Nonetheless, Plank learned his lessons well, coming out of the academy with but one weakness: a poor move toward first, at least in the view of Ty Cobb. Foreman had turned Plank into that rarest of creatures, a cross-firing southpaw with outstanding control of his curve and fastball. Plank signed with a minor league team in Richmond in 1900, but the Virginia League folded a few days later, so he never pitched in the minor leagues. In the spring of 1901, Foreman told his friend Connie Mack he ought to sign Plank. Mack telegraphed Plank, inviting him to join the Athletics in Baltimore. Plank made his debut on May 13, 1901, finishing up a 14-5 loss at Baltimore, then returned to Gettysburg to pitch one last game. He went on to a fine rookie year: 17-13 with 28 complete games in 32 starts, a 3.31 ERA, and the first of his 69 shutouts. The 1902 season, in which the Athletics won the American League pennant, marked a first and a last for the southpaw; he won 20 games for the first time and his 3.30 ERA was his last trip north of 3.00. He also led the league in hit batters with 18 despite giving up only 1.83 walks per 9 innings. Appearing shorter and slighter than his listed 5'11" and 175 pounds, Plank obviously wasn't timid about pitching inside, perhaps not surprising in that his mentor, Foreman, had a reputation as a headhunter. Plank would work in relative anonymity from 1902 through 1907, living in the shadow of Rube Waddell. Playing the tortoise to Waddells hare, Plank won 23 games and led the league in games started in 1903, while Waddell, the prototypical screwball lefthander, struck out batters at an unprecedented rate when he wasnt chasing fire engines or drinking himself blind. Rube finished the season with a 2.44 ERA; Plank at 2.38. Seven years later Rube would be out of the majors and Plank would be posting even better ERAs. Eddie reached his career high with 26 wins (against 17 losses) in 1904, coming in a distant second to Jack Chesbro's post-1900 record 41 wins. The highlight of the year came on September 10 as Plank beat Boston's Cy Young, 1-0, in 13 innings. The shutout was one of Plank's four wins in ten decisions against the old master. The Athletics captured the pennant in 1905, thanks in large part to Planks 24 wins and 346 2/3 innings pitched, both second in the league, and 2.26 ERA, which didnt crack the top ten in a strong pitchers' year. In his two starts against the Giants in that years World Series, Eddie pitched 17 innings and allowed only three earned runs, but lost both games to Christy Mathewson and Joe McGinnity, respectively. Planks 1905 performance, in which his teammates scored zero runs for him, foreshadowed his fate in World Series play, as he would often pitch just brilliantly enough to lose in heartbreaking fashion. 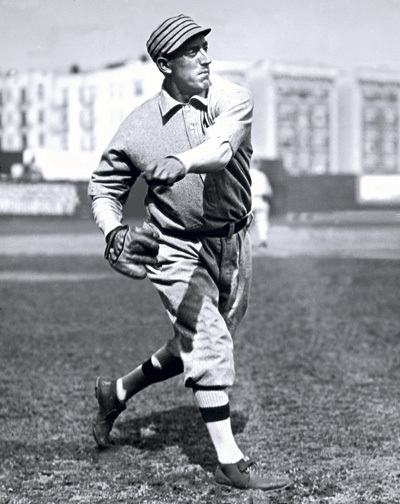 In 1906 Mack worked Plank hard over the first two-thirds of the season, but the pitcher developed a sore arm and was able to start only once in the seasons final 50 games. He was productive, however, going 19-6 with a 2.25 ERA; his .760 winning percentage led the American League, although his 211 2/3 innings pitched were 135 fewer than the previous season. Appearing in a league-leading 43 games in 1907, the southpaw went back to his usual chores, pitching 343 2/3 innings and returning to the 20-win club, going 24-16 with a 2.20 ERA and a league-high eight shutouts. In addition, he was third in the league with 183 strikeouts. The year would be his last venture into 300 or more innings, as he would never again pitch more than 268 1/3 innings in any season, and that would be in the Federal League in 1915. The Athletics weren't a factor in the wild pennant race of 1908, dropping to sixth place with a 68-85 slate, just a half-game ahead of Washington. Planks won-lost record slid with the teams although not as far; he endured his first losing season with a 14-16 mark despite a fine ERA of 2.17. The game of September 20 shows the kind of year it was. Frank Smith of the White Sox threw the second no-hitter of his career, beating Plank, 1-0. The run scored in the bottom of the ninth when Plank was trying to walk Freddy Parent intentionally; Parent crossed things up by reaching out and swatting a sacrifice fly to short right field. As testimony of his consistency, Plank would finish with a losing record only one more time in his long career. In 1909, Philadelphia rebounded to second place, 3.5 games behind Detroit, and Plank came back with them. He finished the year 19-10 with his career-best ERA, a tiny 1.76. He had the honor of pitching the game dedicating Shibe Park on Monday, April 12, and responded by beating Boston, 8-1, giving up just six hits. The game had a tragic ending, however. As catcher Doc Powers caught all nine innings in agonizing pain due to suspected food poisoning, and was taken to a local hospital afterward. Two weeks later he was dead, with "strangulation of the intestines" listed as the official cause. Powers, who was also a physician, starved to death because he could not eat. His intestines were mangled due to a hernia, which some believed he had suffered when he collided with the new parks concrete wall while chasing a foul popup in the seventh inning. The Athletics team of 1910-14 was the first of Mack's two masterpieces, a powerful unit that would win four pennants and three World Series over those five years. Plank was basically the third or fourth pitcher in the rotation behind Jack Coombs (who would go 31-9 with a 1.30 ERA and 13 shutouts, an AL record that still stands), Chief Bender (23-5 with a 1.58 ERA, easily his best season), and Cy Morgan (18-12 with an ERA of 1.55). Next to that assemblage, Plank almost looked like an underachiever with his 16-10 mark and 2.01 ERA. Suffering from a sore arm by the end of the season, he didn't even pitch in the Athletics' five-game World Series win over the Cubs, as Mack used only Coombs and Bender. Plank bounced back in 1911, going 23-8 with a 2.10 ERA and a co-league-leading six shutouts. His luck in the Series improved as he got his first win, a complete-game 3-1 victory over the Giants' Rube Marquard in Game 2. With Game 5 tied 3-3 after nine innings, Mack brought in Plank to relieve Coombs. Plank could have closed out the Series with a win, but lasted only two-thirds of the tenth inning before surrendering the winning run. Plank enjoyed another terrific year in 1912, posting a 26-6 record with a fine 2.22 ERA. However, the Athletics fell to 90-62, one game behind second-place Washington and 15 behind the powerful Red Sox. Indeed, the 1912 season is emblematic of a tendency to underestimate Plank's greatness. His 26-6 record jumps out at us today, but it was only the fourth highest win total in the American League, behind Joe Wood's 34-5,Walter Johnson's 33-12 (and league-best 1.39 ERA), and Ed Walsh's 27-17. In addition, Wood and Johnson each strung together league-record winning streaks of sixteen games, and Marquard won a major-league record nineteen straight games in the National League. Accordingly, Planks solid performance was lost in the shuffle of one of baseball's great pitching seasons. Still, the season had its moments. He dropped a 4-3 beating on Joe Wood to celebrate the Fourth of July. (Wood's next start four days later would be the first of his sixteen-game winning streak.) On September 27 Plank went the distance in a 19-inning loss to Washington's Bob Groom and Johnson. Collins' wild throw let in the winning run as Johnson got the win with 10 innings of scoreless relief. Plank slipped to 18-10 with an unusually high 2.60 ERA in 1913, but the Athletics roared back to the American League throne room. The Giants were back in the Series for the third straight year, having lost to the Athletics in 1911 and the Red Sox in 1912. Plank faced Mathewson in Game 2. The two aces threw shutout ball for nine innings. In a much-criticized move, Mack allowed Eddie to bat for himself with the bases loaded and nobody out in the bottom of the ninth. Plank hit into a fielders choice, the As failed to score, and it all came apart for Plank in the tenth as he gave up three runs, including the go-ahead single to Mathewson. Everything changed in Game 5, with Mathewson and Plank once again squaring off. This time around, the southpaw threw a two-hitter and beat his nemesis, 3-1, to take the Series and send McGraw to his third consecutive Series defeat. The game was Plank's greatest career win; the only Giant run was unearned, scoring due to Planks own error. The Athletics remained apparently unstoppable in 1914, winning 99 games and heading back to the Series, this time against Boston's Miracle Braves. Plank contributed a 15-7 mark, the wins being good for fourth best on the team, as Chief Bender won 17 while Bob Shawkey and Joe Bush each chipped in with 16. Plank's mark was accompanied by a 2.87 ERA, higher than the league average and by far his highest since 1902. He could still pitch brilliantly, though, as his Game 2 effort showed, a 1-0 loss (the run scored in the ninth inning) to Bill James as the mighty Athletics were swept in a major Series upset. It was the final game of Plank's World Series career, and left him with a career 2-5 record in the Fall Classic despite a 1.32 ERA. Through good times and bad, winning or losing, pitching well or not, Plank did everything the same wayquietly. He didn't talk much, generally speaking only when he had something to say. And when he did talk, his only grandson (Edward Stewart Plank III, born much too late to know him except by reputation and memory in the family) points out, people listened. Moreover, he and his more outgoing teammate Chief Bender seem to have been patient and kind with rookies who wanted to learn. Rube Bressler made the point clearly to Lawrence Ritter: "I used to try to get near [Bender and Plank] and listen to what they were talking about, and every question I'd ask they'd pay attention and tell me what they thought. I used to put sticks behind my ears so they'd stand out further. Boy, I wanted to hear what those guys had to say." At 39 years of age following the 1914 season, Plank had been talking about quitting baseball for several years. His workload had diminished and Mack had nursed him along for the last two years, using him primarily against clubs he was most likely to dominate. Mack knew that Bender and Plank were talking to Federal League agents. He asked waivers on them and Coombs, and released all three pitchers. Coombs signed with Brooklyn of the National League. Bender went to the Baltimore Terrapins of the Federal League; Plank to the new league's St. Louis Terriers. Plank had a good year with the Terriers, who wound up in a virtual tie for first place with the Chicago Whales, contributing a 21-11 record and 2.08 ERA. He reached a major milestone on September 11 with a 12-5 win over Newark, making him the first southpaw to attain three hundred victories. When the Federal League folded after the 1915 season, Terriers owner Phil Ball bought control of the St. Louis Browns and retained Plank. He went 16-15 with a 2.33 ERA in 1916 for a fifth-place team (albeit with a winning record of 79-75). He could only go 5-6just his second losing recordin 1917 in spite of his second-best ERA, a glittering 1.79. On August 6, at age 41, he hooked up with Walter Johnson, going down 1-0 in 11 innings, his seventh loss against three wins in match-ups with the Washington ace. It was Plank's last game; noting some stomach problems, he announced his retirement the next week. Despite his announcement, Plank was still in demand. On January 22, 1918, the Yankees traded pitchers Urban Shocker and Nick Cullop, infielder Fritz Maisel, second baseman Joe Gedeon, catcher Les Nunamaker, and cash to St. Louis for second baseman Del Pratt and Plank. Now 42, Plank would have been the oldest active player in the game. Having announced his retirement, he had no intention of changing his plans. "I will not go to New York next season," he said from his Gettysburg farm. "I am through with baseball forever. I have my farm and my home and enough to take care of me, so why should I work and worry any longer?" According to The Historical Register, in 1918 he pitched a bit for an industrial league team in Steelton, Pennsylvania, posting a 4-2 record in 52 innings. The Bethlehem Steel Company owned all six teams in the league, and offered current and former major leaguers  including Plank, Dutch Leonard, and Joe Jackson  an opportunity to play baseball while avoiding the draft. Plank had taken pretty good care of himself throughout his career, watching his money and investing it reasonably well. He spent his retirement farming, operating a Buick shop, and leading tours of the Gettysburg battlefield. Since he was a taciturn man, it's not likely that most visitors to the battlefield knew they were in the presence of one of the game's great pitchers. Plank had married Anna Myers in 1915; the couple had one son, Edward Stewart Plank Jr. Having left baseball, Plank spent his time handling his various interests, even contemplating a run for public office before suffering a stroke on February 22, 1926. Plank died two days later, at the age of 50. He was buried in Evergreen Cemetery in Gettysburg. Allen, Lee, and Tom Meany. Kings of the Diamond. New York: G. P. Putnam's Sons, 1965. Eddie Plank files at the National Baseball Hall of Fame and Museum in Cooperstown, New York. Enders, Eric. 100 Years of the World Series. New York: Barnes & Noble Books, 2003. Gulden, Dave. "The Forgotten Games of Eddie Plank." The National Pastime. 24 (2004), 41-47. Hoie, Bob, and Carlos Bauer, compilers. L. Robert Davids, Bob McConnell, Ray Nemec, John Benesch Jr., and Bill Weiss, eds. The Historical Register: The Major & Minor League Records of Baseball's Greatest Players. San Diego and San Marino: Baseball Press Books, 1998. Honig, Donald. The Greatest Pitchers of All Time. New York: Crown Publishers, Inc., 1988. Leventhal, Josh. The World Series: An Illustrated Encyclopedia of the Fall Classic. New York: Black Dog & Leventhal Publishers, 2001. Mack, Connie. My 66 Years in the Big Leagues. New York: John C. Winston Company, 1950. MacKay, Joe. The Great Shutout Pitchers: Twenty Profiles of a Vanishing Breed. Jefferson, North Carolina, and London: McFarland, 2004. Meany, Tom. Baseball's Greatest Pitchers. New York: A. S. Barnes and Company, 1951. Neft, David S., and Richard M. Cohen. The World Series: Complete Play-by-Play of Every Game 1903-1989. New York: St. Martin's Press, 1990. Palmer, Pete, and Gary Gillette, eds. The Baseball Encyclopedia. New York: Barnes & Noble Books, 2004. Sinins, Lee. Sabermetric Baseball Encyclopedia. Smith, Ira. Baseball's Famous Pitchers: Capers Cut and Records Made by Fifty-three Pitching Greats. New York: A. S. Barnes and Company, 1954. Spatz, Lyle. Yankees Coming, Yankees Going: New York Yankee Player Transactions, 1903 Through 1999. Jefferson, North Carolina, and London: McFarland, 2000. Thorn, John, Phil Birnbaum, Bill Deane, et al. Total Baseball: The Ultimate Baseball Encyclopedia. 8th ed. Wilmington, Delaware: Sport Media Publishing Inc., 2004. Westcott, Rich. Winningest Pitchers: Baseball's 300-Game Winners. Philadelphia: Temple University Press, 2002. Wilbert, Warren N. What Makes an Elite Pitcher? Young, Mathewson, Johnson, Alexander, Grove, Spahn, Seaver, Clemens, and Maddux. Jefferson, North Carolina, and London: McFarland, 2003. Telephone conversation in November 2002 with Edward Stewart Plank III, who kindly provided me with invaluable material about his grandfather. I am especially grateful to him.